Nick, Hannah, Dane, Paige, and Max! 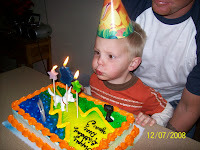 : DANE IS 3! Dane turned 3 on December 7th! 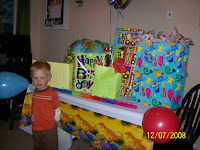 We had a fun little party...it was on sunday, so we couldn't be too wild! All my family that lives here and G&G DeRusha came over and we played a few games, ate some Bolt cake and opened presents! We busted open a pinata too and that was funny! He got two little guitars so now he says he's a rockstar! He got a robot that shoots him and he can hide from, (Dane has a GREAT imagination), and he got a bike. He wasn't really into his bike, and on monday I found out why...he thought it was the bike we got for a buck from a yard sale and just painted it! After I convinced him this was a brand new bike, we was a happy guy! 3 years definately goes by fast! I love my Dane--he makes me happy!